Baobab has long been revered by indigenous cultures of Madagascar and Africa. Considered to be one of Africa’s most important superfruits, Baobab has been a part of the traditional diet for centuries. Baobab is considered to be a nutritionally ideal, prebiotic superfruit containing dietary Fiber, Calcium, Magnesium, Potassium, Vitamin C and an abundance of antioxidants with an ORAC value of 7,000-8,700 per 12 gram serving. The baobab fruit is a large, hard pod filled with fruit pulp and seeds. 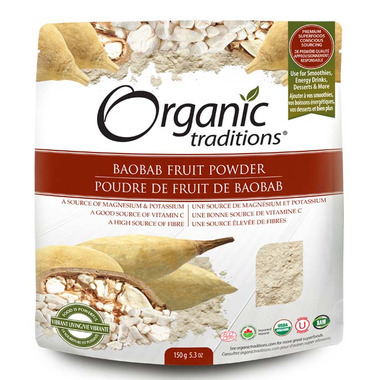 Organic Traditions Baobab fruits are sustainably harvested. Instead of harvesting directly from the tree, baobab pods are collected only once the mature pods have fallen to the ground during the dry season. This environmentally friendly method of fruit harvest ensures the longevity of each Baobab tree. Delicious fresh citrus taste with notes of pear, custard and vanilla. 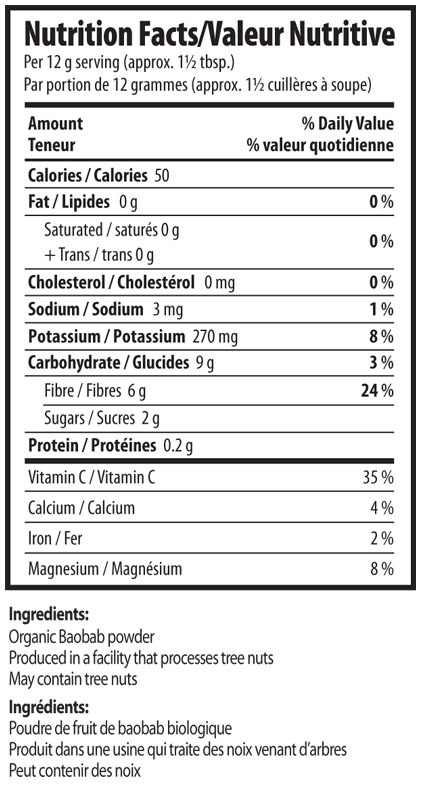 Can be used as a healthy sweetener.